N Alsudani. Effect of extracts of Zizphus spina-christi L and Olea europaea L. on the larval stage of Echinococcus granulosus . The Internet Journal of Parasitic Diseases. 2006 Volume 2 Number 1. Extracts different parts of two medical plants Zizyphus spina-christi L. (Fruits, leaves and Christ) and Olea europaea L. (Fruit and leaves) were studied in this investigation against the larval stage (protoscolices) of E. granulosus. All aqueous extracts have a antimicrobial activity against the Protoscolices viability, but the greater effect was to 1000 mcg/ml for the leaves of Z. spina-christi that kill all protoscolices in 72 hrs after treatment, while the lowest effect was to 50 mcg/ml of Christ of the same plant that decreased the viability to zero % in 240 hrs after treatment, and all other extract effects were between these limits. The protoscolices still live in control group in HCF+NS in ratio 4:1 over than 20 days (480) hrs. No effective chemotherapy is currently available for the medical treatment of cystic and alveolar hydrated disease in humans. Within recent years several drugs, notably mebendazole, albendazole, praziquantel, mitomycinic, isoprinosine and other on the elminthic drugs have shown promising results in the reduction and induction of ultrastrcuctural damage of the larval cystic mass (Sarciron, et al., 1992 and Satoh , etal.,2005). However, the treatment of echinococcosis with these compounds has also shown only acytostatic effects as evidenced by the survival and resumption of cystic growth in treated hosts following cessation of drug treatment or after transplantation of cystic material from drug treated hosts into rodent hosts (Novak, 1990). Limited inconsistent effects of the above, mentioned drags appear to be related directly to the age of infection, dosage of drug, route of administration, and treatment regimens (Andersen, 1995). The use of antimicrobial active components that were isolated from higher plants has been limited to antiseptics and disinfectants and these had little applications of such ingredients yet reported in systematic therapy (Orjala et al. , 1998, Lim, et al. 1998 and Walker etal., 2004). As the Iraqi flora is rich in plants the possibility of finding new antimicrobial agents still widely ahead, so, the aims of this study was to study aqueous extracts of zizyphus spina- Christi l. (leaves, fruits and tree wood) and olea europaea L. (fruits and leaves) and determine the exactly effects of these extracts, on the viability of protoscolices of Echinococcus granulosus in comparison with a control group. Studied parts: fruits, leaves and tree woods (Christ). Studied parts: fruits and leaves. These plants were collected from gardens in the Basrah district. Each dried plant parts were grounded to gm of powder and then mixed with 100 ml distilled water. The mixture is to be mixed by magnetic stirrer for 72 hrs in discontinuous period times – at room temperature and heated for 12 hrs at 50-55 Co with stirring. The mixture was put in centrifuge 3000 xg for 1 hr, then made narrow concentrations from crude supernatant extracts (50, 100, 250, 500, 750 , and 1000 mcg/ml) in order to study the influence of these concentrations on viability of protoscolices (Al-Saimary & Benyan, 1997). Percentages of protoscolices viability or survival were determined by examining them by compound microscope for permeability of aqueous eosin stain (0.5%) as a vital stain of protoscolices-, Green protoscolices: Viabel, Red protoscolices: Deal. (Smyth and Barrett, 1980). The protoscolices viability for each of treating and control groups were examined in serial period times until dead all of protoscolices. The percentage of protoscolices viability decreased from 98% to 4% in over than 20 days after being preserved in HCF+NS 4:1 without treatment.Fig-1-. In general the concentration 1000 mcg/ml showed great effects on protoscolies viability in all of studies plant extracts, while 50 mcg/ml had the lowest effects. The results of effects of plant extracts were arranged according to a great activity. Leaves extract of Zizyphus spina-Christ have a great effects on protoscolices in comparison with other extracts of parts. 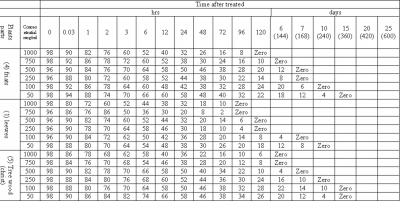 Into inhibited the viability to zero% in (72, 96, 144 and 168) hrs after treated with (1000 & 750, 500 & 250, 1000 and 50) mcg/ml receptively- Fig-3-. In (72, 96, 120, 168) after treated with (1000, 500 % 750, 250, 100 & 50) mcg/ml of leaves extract of Olea earopaea respectively. Fig-6-. In (96, 120, 144, 168, 240) hrs after treated with (1000, 500, 520, 100 and 50) mcg/ml of fruits extracts of Zizphus spina–Christi respectively. Fig. –2-. And finally in (120, 144, 168 and 240) hrs after treated with (1000 & 750, 500, 100 & 50) mcg/ml of Tree wood (christ) extracts of Zizyphus spina-Chriti . In this investigation we studied the efficiency of different parts of two plants Zizyphus spina-Christi and Olea europaea against protoscolices viability of Echinococcus granulosus. In accidentally infected human, surgical intervention for removal of hydatid cysts is performed but this surgery is not without risks, and in many countries of the world, the mortality rate rages between 1-4% and many reach 20% or more in cases of repeat surgery (Walker etal., 2004 and Mathis , etal., 2005). Some anthelminthic drugs cause glycogen depletion of the parasite and destroy the microtriches of the germinal layer of hydatid cyst. The main function of the microtriches implanted in the laminated layer, is assimilation of nutrients and physiological homeostasis. (Satoh , etal.,2005). In this study, our results indicated and evidenced the antimicrobial activity of medicinal plants. Leaves of Z. spina-Christi decreased the viability of protoscolices in standardized short time (72) hrs for (1000) mcg/ml to the lowest effect of 50 mcg/ml of Christ of the same plant who reached the viability to zero % in 240 hrs after treatment of this can concentration, and all of others concentrations of other plant part distributed between these two limits times. These parameters found necessary to give the light spot on the action of these plants and open a wide space for more of future studies to find a typical chemotherapeutic agents against many of microbial diseases-In general –or against hydatidosis- in especially. Our results confirmed the results of previous studies who carried out other anthelminthic drugs that cause a vacuolization and rupture of the germinal membrane along with swelling and rounding of mitochondria that appears to be non specific degeneration effects that have been previously reported following treatment (Richards, et al., 1989, Sareiron, et al., 1992, Marchiondo, et al., 1994 and Zhang ,etal.,2003). We thinks that the extracts of the medicinal plants decreased the protoscolices viability due to the important role of these extracts in the break down of the biological activities of protoscolices by interference with its metabolism, and may be have target sites such as inhibitors of protein and DNA synthesis or within the cytoplasmic components such as -lactam antibiotics. (Chopra and Hacker, 1992, Oliva, et al., 1992, Bennett Chopra, 1993 and Walker etal., 2004). Six concentrations of aqueous extracts of various parts two medicinal plant sZizyphus spina-Christi & Olea earopaea were used in this study and found that the 1000 mcg/ml has greatest activity while 50 mcg/ml has a lowest activity. Each of tow above plants affected on the protoscolices viability. In control group, HCF+NS in ration 4:1 keep the protoscolices viable to over than 20 days (480) hrs. We recommend a continuous work about extracted pure compound from these two plants to find another antimicrobial agents against parasites and / or bacteria that not affected by treated with a common therapeutic agents. 1. Al- Saimary, I. E. and Benyan, A. Z. 1997. In vitro chemotherapeutic effects of antibiotics and plants extracts on protoscolices viability of human hydatial cysts. BRJ. Accept No. 1314. 2. Andersen, F. L. (Editor), 1993. Comendium on cystic echinoccosis with special reference to the Xinjiang uygur autonomous region. Brigham young Univ., USA., pp: 162-195. 3. Andersen, F. L. 1995. Establishing a control program for cystic hydatial disease in endemic regions of the world. Brigham young Univ., USA., pp: 3-5. 4. Bennett, P. M. and Chopra, I. 1993. Molecular basis of -lactamase induction in bacteria. Antimicrob. Agent Chemother., 37(2): 153-158. 5. Chopra, I. And Hacker, K., 1992. Uptake of minocycline by Escherichia coli. J. Antimicrob. Chemother., 29: 19-25. 6. Lim, H., Kubota, K., Kobayashi, A. and Sugawara, F., 1998. Sulfar-containing compounds from Scorodocarpus borneensis and their antimicrobial activity. Phytochemistry, 48(5): 787-790. 7. Marchiondo, A. A., Ming, R., Andersen, F. L., Slusser, J. H. and Conder, G. A., 1994. Enhanced larval cyst growth of E. multitilocalaris in praziquantel-treated jids. Am. J. Trop. Med. Hyg., 50(1): 120-127. 9. Novak, M., 1990. Efficacy of mitomycinc against alvealar Echinococeus. Int. J. Parasitol., 20: 119-120. 10. Orjala, J., Main, P., Rlai, T.and Sticher, O. 1998. Cytotoxic and antibacterial alkenyl phenols from Piper gibbilimbum. J. Nat. Prod., 61(7): 939-941. 11. Richards, K. S., Morris, D. L.and Taylor, D. H. 1989. E. multilocularis: Ultra structural efect of In vivo albendazole and praziquantel therapy, singly and in combination. Ann. Trop. Med. Parsitol., 83: 479-484. 12. Sarciron, M. F., et al.. 1992. Effects of multiple doses of isoprinosine on E. multilocularis metacestodes. Antimicrob. Agents chemother., 36: 191-194. 13. Satoh,M.,etal. (2005). Echinococcus confirmed on Kunashiri Island .AM.J.TROP.MED.HYG.72:284-288. 14. Schantz, P. M., 1986. Hydrated disease, inclinical medidine. Hatper & Rowpud. Philadephia pp: 1-12. 15. Schantz, P. M., Brandt, F. H., Dickinson, C. M. and Eberhard, M. L. 1990. Effects of albendazole on E. multilocalaris infection in the mangolian jird. J. infect. Dis, 162: 1403-1407. 16. Walker ,M.,Rossignol ,J., Torgerson, P., Hemphil, A. (2004).In vitro effects of nitazoxanide on Echinococcus granulosus protoscolices. J.ANTIMICROBIOL.CHEMOTHER., 54:609-616. 17. Zhang , W., Li.J., and McManus , D.(2003). Concept in immunology and diagnosis of hydatid disease. CLIN MICROBIOL.REV .16:18-36.